Until recently, the properties and compositions of the microbiota in the planet are still largely a black box. Next generation sequencing (NGS) has proven to be an invaluable tool for investigating diverse environmental and host-associated microbial communities, helping to generate enormous new data sets that can be mined for information on the composition and functional properties of vastly great numbers of microbial communities. The applications of NGS in microbial community profiling include amplicon sequencing (typically 16S rRNA sequencing for bacteria and 18S rRNA/ITS sequencing for fungi), metagenomic shotgun sequencing, metatranscriptomic sequencing and viral metagenomics sequencing, which can help to answer the questions of ‘who is present in the community’, ‘what could they be doing’ and ‘how these microorganisms interact’. The strategies are outlined in Figure 1. Figure 1. Strategies for metagenomics study. Adapted from Bikel et al., 2015. Our PhD-level specialists can advise you all the way, both during the project designing stage and during the implementation of the project regarding sample preparation and the technical approach to use, endeavoring to minimize the cost of sequencing while maximizing the high-quality data output in terms. After sequencing, our bioinformatics specialist can assist you with the analyses for your project and interpretation of the sequence data to meet the publication or application requirements. State-of-the-art pipelines: experienced personnel in experimental design, sample handling, DNA extraction, library preparation, sequencing, data analysis and interpretation. Efficient and reliable sequencing procedures: we utilize up-to-date Illumina and PacBio’s sequencing instruments, cutting-edge sequencing technologies and standard workflow to ensure the accuracy and reliability of the results. Outstanding service: With highly qualified specialists, we provide high-quality base sequence, stringent quality controls, comprehensive bioinformatics analyses using the latest sequence databases and software tools, generating publication-ready data. Cost-effective price with rapid turnaround times: Our high success rates and quality data prevent costly repeat experiment and sequencing. Bikel S., et al. 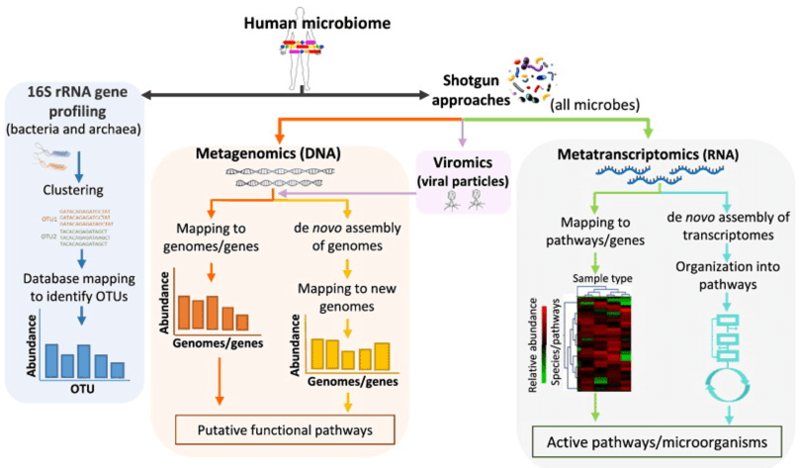 Combining metagenomics, metatranscriptomics and viromics to explore novel microbial interactions: towards a systems-level understanding of human microbiome. Computational and Structural Biotechnology Journal. 2015, 13:390-401.